Iconic legendary singer, 2Face Idibia is set to drop his biography. 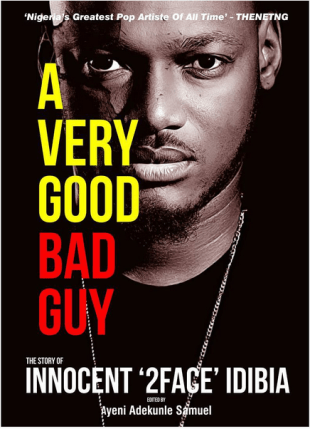 The title of the book is ‘A Very Good Bad Guy‘ and would be published by an online media site. The book was edited by Ayeni Adekunle Samuel and would be released on Friday, September 18, 2015. The biography is to be a part of 2face’s 40th birthday celebrations that would include a concert, a flag off party at club Rumours, and more. 2face Idibia will be 40 on September 18, 2015. The celebration concert, which he has themed the ‘FORTYfied All-Star Tribute Concert’, is the subject of huge planning and promotion. The event will hold at the Eko Hotel Convention Center on Sunday, September 20, 2015, and will be anchored by Nigeria’s comedy icon, Basketmouth. Artistes slated to perform include; Burna Boy, D’banj, veteran highlife musician Dr Victor Olaiya, Sound Sultan, Wizkid, fellow Plantshun Boiz group member Blackface, Seyi Shay, Vector, Timaya, Wande Coal, Omawumi, Patoranking, 9iceand others.